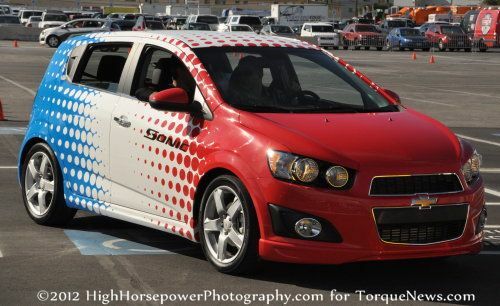 The Chevrolet Sonic Turbo is a spunky little car, with 138 horsepower and 148lb-ft of torque previously being sent to the wheels strictly via a 6-speed manual transmission while those who wanted an automatic transmission were forced to go with the less powerful 1.8L engine but effectively immediately, buyers of the 2012 Chevy Sonic Turbo can pick a new 6-speed automatic transmission. The 2012 Chevrolet Sonic Turbo is a great deal of fun to drive – packing 138 horsepower and 148lb-ft of torque - but those who lack the capacity to deal with the clutch pedal have previously been forced to go with the 1.8L Ecotec engine that offers just 125lb-ft of torque. In this lightweight compact sedan and hatchback (roughly 2,700 pounds), that extra torque goes a long way in adding “fun to drive” factor and allowing the Sonic Turbo to move out from 0-60 in just 7.8 seconds. This drivetrain also allows the turbocharged Sonic to yield 29 miles per gallon around town and 40mpg on the open road. Unfortunately for some, that fun and fuel economy was originally reserved for those who could drive manual transmission but starting this month, new Sonic Turbo buyers can pick a new 6-speed automatic transmission. "Providing the option of a turbocharged engine to our non-stick driving Chevy customers allows us to offer everyone the thrill and power of a fuel-efficient Ecotec 1.4L powerplant," said Jim Danahy, vehicle line director and vehicle chief engineer for North American small cars. "Both in the Sonic and Cruze, the engine enables better fuel economy without sacrificing power or performance. It's really a winning combination." While there is some loss in acceleration when the 2012 Chevy Sonic Turbo is fitted with the 6-speed automatic transmission – dropping the 0-60 time to around 8 seconds - the bigger story is the decline in fuel economy. The self shifting gearbox reduces fuel economy to 27 miles per gallon around town and 37mpg on the highway so the inability or lack of desire to drive a manual transmission will cost you around 10% of your fuel economy. The Chevrolet Sonic Turbo 1LT sedan with a manual transmission starts at $15,765 while new 6-speed automatic option pushes the price up by $1,070 to $16,835. The Sonic Turbo hatchback price starts at $17,635 for those models equipped with the new automatic gearbox thanks to the same increase of $1,070. These models are available for order at your local Chevrolet dealership right now but having had the pleasure of driving the Sonic Turbo with the manual transmission – I strongly recommend learning to drive a manual before buying your new Sonic. The increased fuel economy, fun to drive factor and savings are worth it. Nah. Those estimates are a nice reference, but rarely on point enough to be considered the word of God on actual fuel mileage. And manuals are mostly like automatics in the sense that how you drive them effects the gas. And for those who never learn to drive them, they just aren't missing enough to mess with it. It's nice to conquer such an intimidating thing, but it isn't hard enough to deserves such a reputation, nor easy enough to just brush aside and breeze through. And it sure as heck doesn't create a better "relationship" with cars... Kind of ruins the fun, actually, in my (admittedly kind of limited) experience, especially on the highway... I'm happier Chevrolet went for it. I'd rather that than for them to do like Ford, and deny their best engines to those who bother to learn stick-shifting. Since those EPA estimate deficiencies can be easily made up almost entirely by treating and driving a car like you should do to keep it properly maintained, it's not worth it, I don't think. I still kind of have to wonder if the 13 lb.-ft. more of torque is a $700 tune or not, actually.